rts and Crafts style homes have always appealed to us because they are so “homey.” But beyond just feeling like a place you’d want to curl up and read a book, these Turn of the Century homes are strong, clean-lined, simple and built to last. 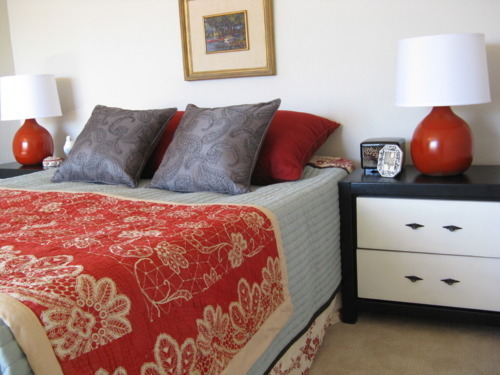 We had the pleasure of staging a home like this over the last two days, and it was a real treat. The structure of this 1909 beauty is muscular and pleasingly direct. We always say that a home will “tell” us what it wants and needs us to fill it with. This home was no exception. She “spat out” items that we thought “just might work.” But no, she wouldn’t have it. After the first hour, we were so in tune with her early 20th Century vibe that we’d know instantly what would work — and what wouldn’t. 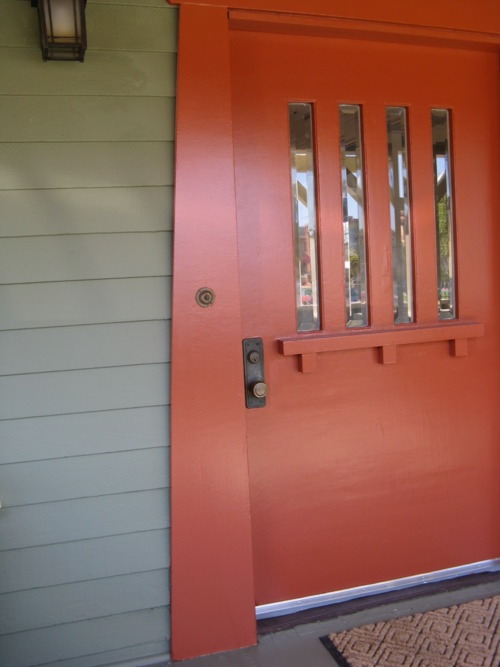 This beauty is for sale and can be found at 4433 Clayton Ave., LA 90027. The listing is here. 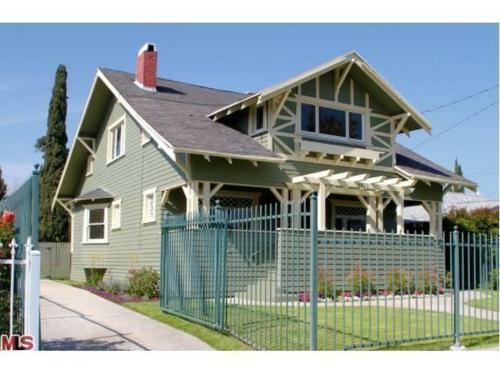 The home is known locally as “The Big Green Craftsman” because of its stature and presence in the neighborhood. 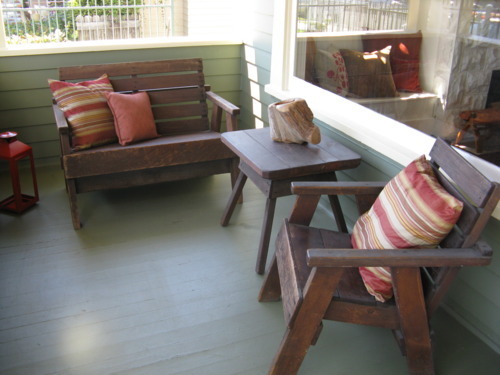 The front porch is a fine napping zone, complete with rustic wood furniture which needed nothing more than a few red striped pillows… and that log-thingy. 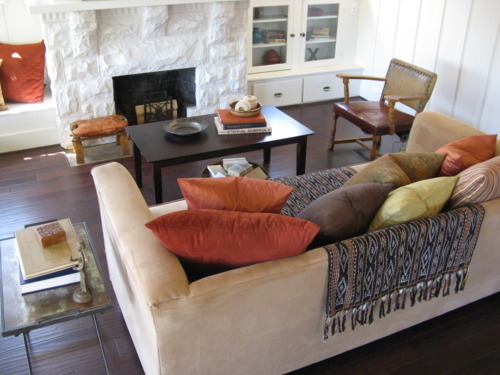 Peek inside to the eclectic living room with its persimmon and caramel tones. 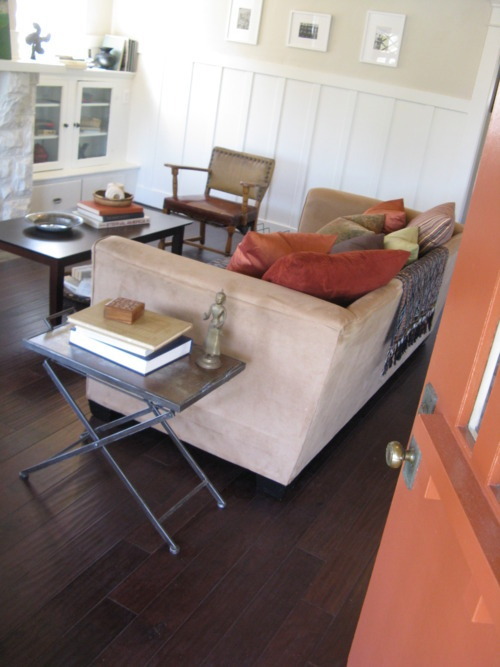 Hits of dark red key back to the door color and carry to other rooms in the home. 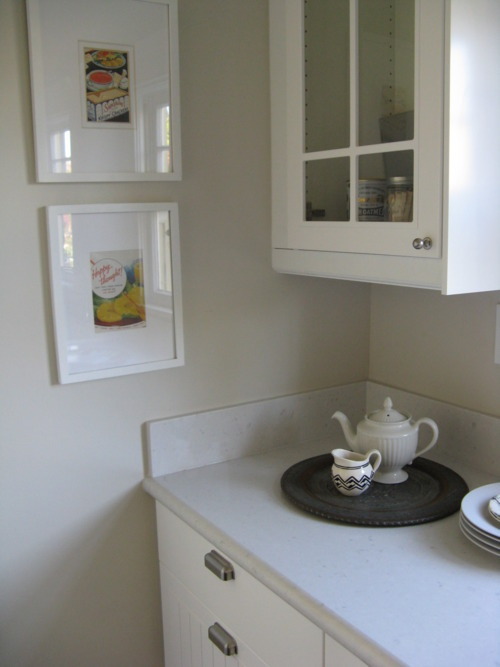 We filled simple white frames with vintage B&W photos so as to not compete with the white wood paneling. 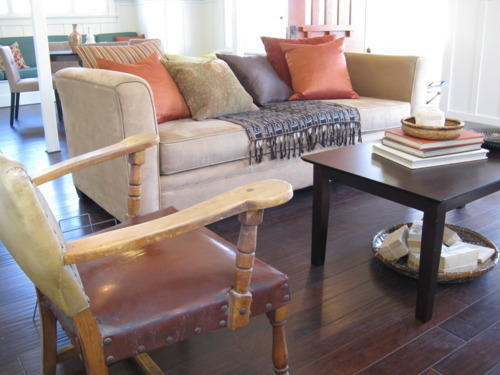 This wood and leather chair dates back to the original era of this house. We love its throne-like qualities. We placed a vintage Ikat throw over the sofa to rev up the color story, and paired the sofa with a transitional coffee table. 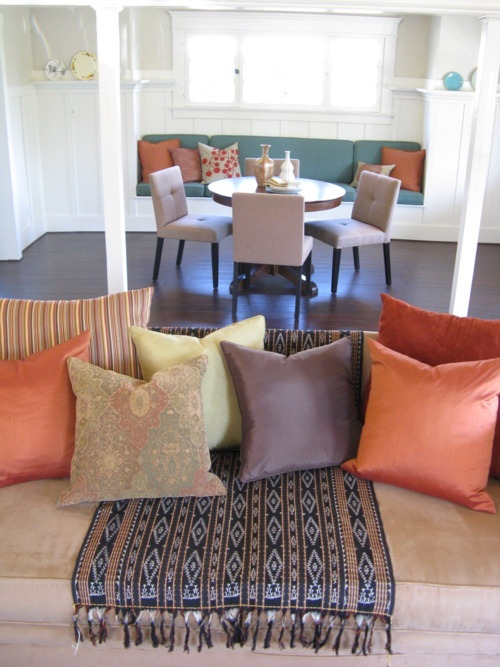 A soft Persian rug design pillow and a fresh stripe one share sofa space with persimmon twins. A vintage brass bowl beckons from the table. 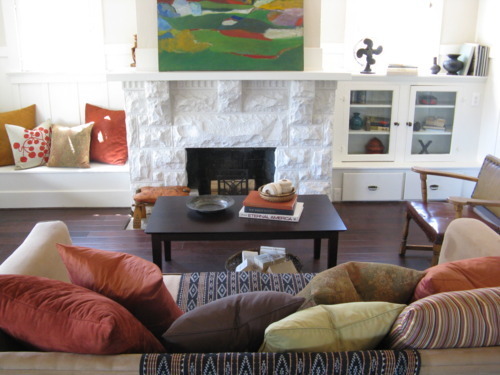 The white-painted stone fireplace provides a massive foundation and focal point for the room. 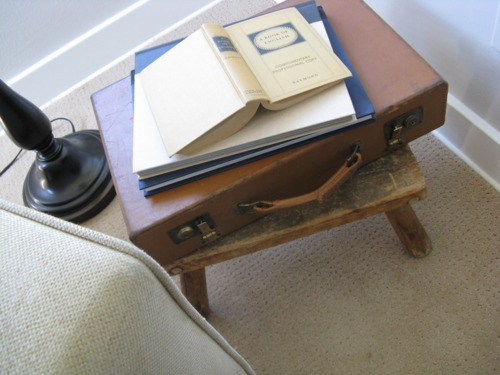 We found an antique leather footstool for the hearth and an Arts and Crafts style log holder to tuck into the firebox. An estate sale abstract painting from an Otis art student in the 1960s graces the mantel. Its abstract forms call to mind a deconstructed stained glass window design, and its fresh colors are echoed throughout the room. A built-in window seat on the left and bookcase to the right are typical of early Craftsman homes — abundant in built-in storage. A view over the sofa and into the dining room reveals a pair of slim columns neatly dividing the two spaces without much visual interruption. The dining area features a long banquette window seat bearing teal Mid Century cushions and more of the rich orange tones in a selection of throw pillows. A plate rack above holds Fiestaware and other vintage plates. 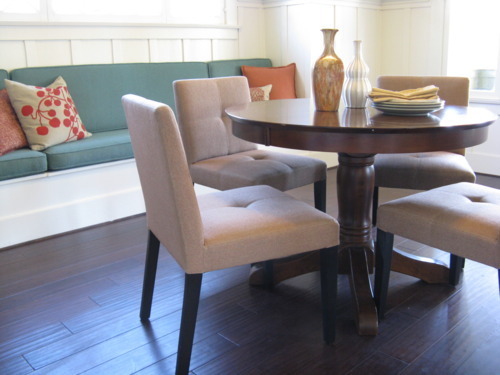 A simple wood table and chairs with a slight Mid Century modern feel pair easily with the dining area’s banquette seating. The master bedroom gets a strong dose of color from a pair of paprika-toned lamps flanking the aqua bed.The throw is vintage, and the oil painting above the bed is a Mid Century plein air painting by Mildred Waters. 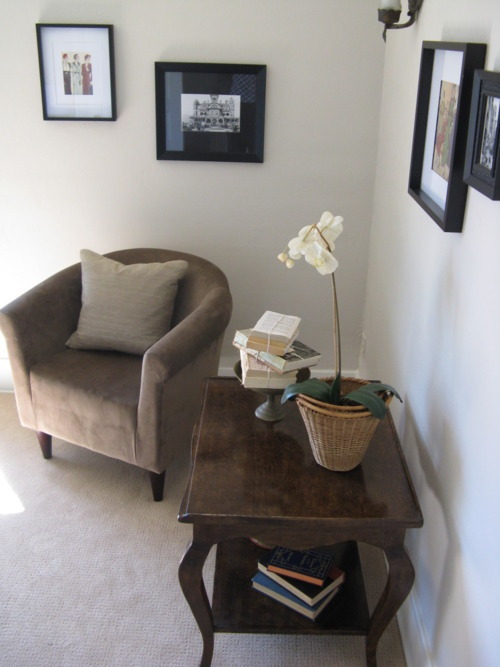 We created a softly toned sitting area in the master bedroom. 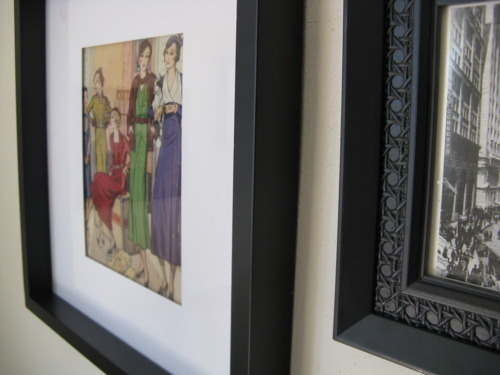 Illustrations from a 1932 sewing pattern catalog are framed and used throughout the room. 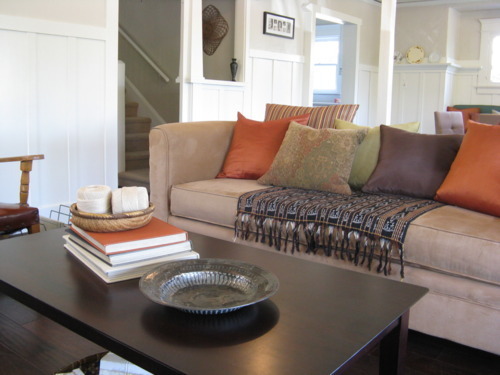 A small additional sitting room is part of the master suite. We outfitted it with a comfy chair ready for napping or reading. 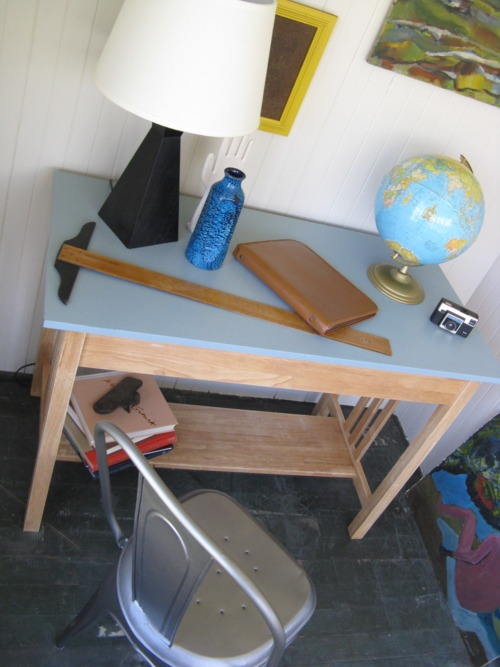 A vintage footstool holds books and a vintage pair of shoe forms create some lighthearted fun below. 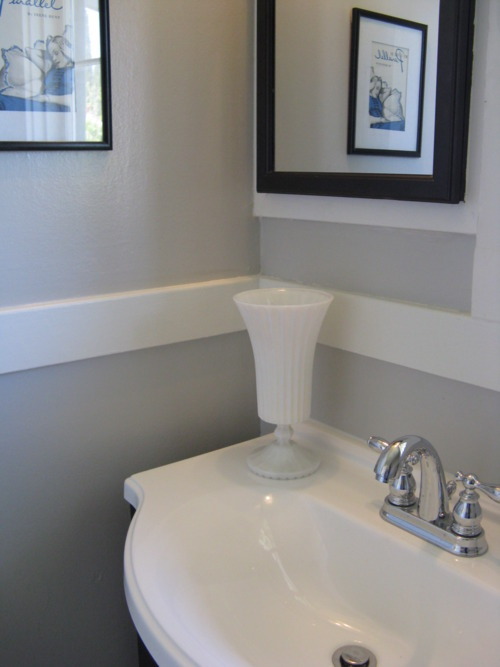 The master bath is treated to a simple B&W color scheme. 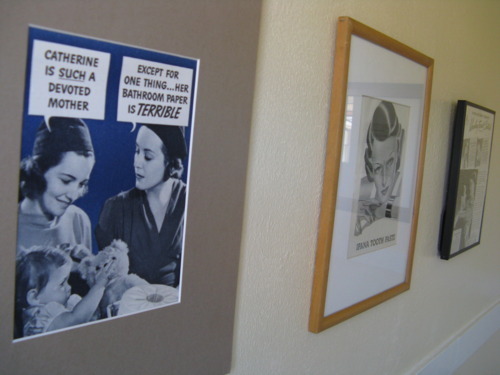 We put humorous vintage magazine ads in the main bath. 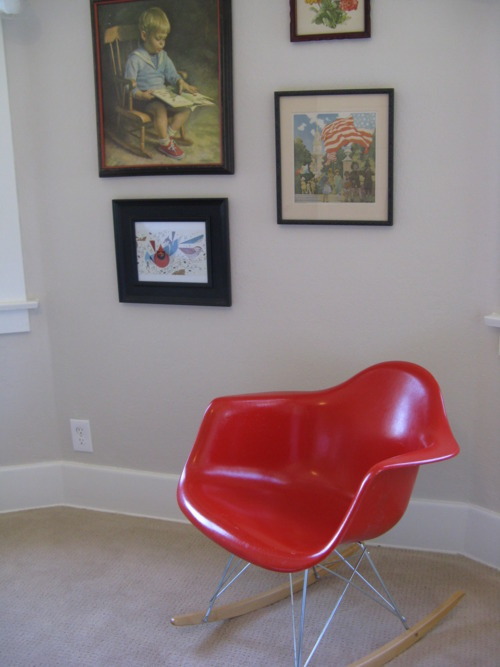 A youth room features an Eames molded rocker and vintage framed prints, all featuring doses of red to tie in with the chair. 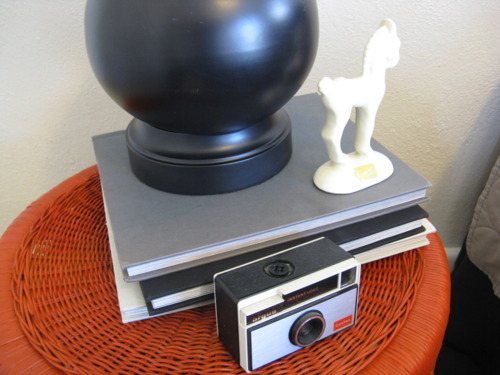 We painted a vintage rattan table a bright red and accessorized with a vintage camera and a whimsical pony from the 1950s. 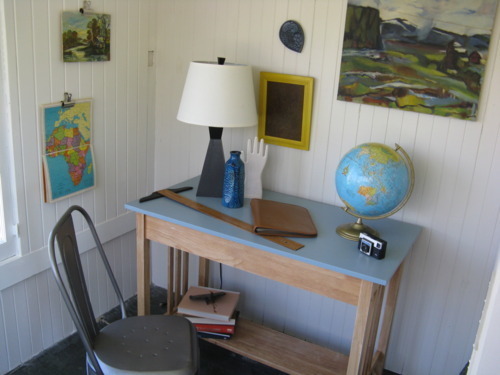 Off the youth room is a small office with an industrial unfinished floor. We brought in a desk, Tolix chair and everything one might need to work from home - well, almost everything — if one is a glove designer/cartographer/graphic designer/photographer. The kitchen called out for more vintage magazine ads to be framed and hung, so that’s just what we did.